It’s been a week (or more) that almost the whole Europe is panicking about E.coli. Some of my friends are quite careful of what they eat. One of them is even thinking about not eating veggies at all! I just couldn’t care less. The older I am, the more I think that death can happen to anyone tomorrow if Allah SWT wants it. The destiny of each person has been written already. If I were destined to die tomorrow, whether or not I would be infected by the E.coli, I would die anyway! Ok, that’s creepy right?! Hahahaha. But you know. Veggies are not even banned by the government. It’s different when you eat veggies that are contaminated with E.coli (and you know it before hand), then that’s the same as suicide! But the veggies are still safe to eat! So why bother to be paranoid? Hehehehe. I was also laughing when people got suddenly afraid when it’s "predicted" that Jakarta would have tsunami or earthquake in few years time. First of all, no one can predict WHEN exactly the earthquake will happen. Second of all, (back to my previous point) if you’re the only person in Jakarta who was destined to live, you would live no matter what! You would live even though the whole Jakarta was flat! Amalia darling, I haven’t read your email yet, but I wanted to first let you know that I’m fine. I’m at home now watching the heartbreaking news on tv. The earthquake we felt here was about 5 on the Richter scale. At the time of the earthquake, I was on the 9th floor; therefore, the shaking was amplified. Fortunately, we evacuated the bldg & no one was hurt. I hope those who are closer to the center of the earthquake find food & shelter soon. Thanks for checking up on me, hon! I’m so glad she is safe! I was thinking about her last night out of the sudden (see my previous post). I felt a bit worried for unclear reasons. I’m not sure if it’s a coincidence, but I take it as a sign that something bad was going to happen. Which it did. I watched the live pictures of the tsunami in horror! But I’m so grateful that she is safe and sound. I want to share with you a great reporting video, showing how Brisbane was transformed into a sea. This is filmed mostly in Coronation Drive, a long road along the Brisbane River. You can see how high the water was. My alma mater, the University of Queensland, is seen badly flooded. It’s sad to see this video :(. One of the comments on the video cracked me up!!! xblghasm: they’ve become obselete because you can’t rideï»¿ a kangaroo to work now because of the floods. We’re all riding sharks. Steer clear of the stereotypes. Our street in Warren Street St Lucia in the Western Suburb of Brisbane is under water, we have been forced to evacuate to designated care centre..thank God we alive. My place is in the yellow zone so water will pass through a corner of my block but I am on the second floor so should be alright. and 1/4 of UQ either is or will be flooded soon. I live in Indooroopilly, which is like a little hill next to St. Lucia, but I am just a bit surprised even Indooroopilly and some other suburbs on higher ground still get flooded. Like Toowoomba which is on top of the Toowoomba ranges (like on top of a mountain). Went out for a walk last night, there are not many cars on the road, the news told us to stay at home and avoid unecessary travel. I’ve seen some photos from St Lucia, like the whole Sir Fred Drive is under water… And the water is to rise further until it peaks on Thursday. So I am still waiting anxiously for the water to come. Oh, and the whole Brisbane is shut down till Friday. Alhamdulillah gw ga kena sih. Tapi daerah sekitar gw udah evakuasi. Insya allah ga papa lah ya..
(*) Note: "woolies" is short for Woolworths, a supermarket chain in Australia. I seriously couldn’t sleep well today. I was too worried with the floods in Queensland. As expected, when I woke up, Brisbane was flooded already. The city (CBD) was closed and people were evacuated in some areas. The worst is yet to come. People are saying that the flood will be worse than the 1974 floods. The combined capacity of dams in Queensland is 100% and is overflowing. It shocks me. I couldn’t stand looking at those pictures. I was there. I knew the area. The good thing is that Brisbane is not a flat city. There are some high-lying areas so if people can evacuate on time, they’ll be alright. And I have to say, I’m impressed by how the government is handling the disaster. Maps of low-lying areas were published so that people would stay alert. Authorities are ready to evacuate people before the floods reached the area. But as the flood now covers the area the size of France and Germany combines, I fear the worst un-imaginable situations could happen. Thankfully, my friends have been sending me updates and they are okay. Those who haven’t sent me any news, I can just pray for them :(. 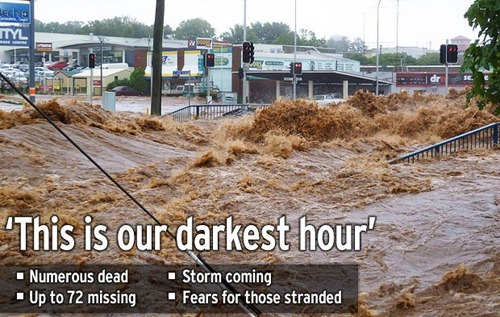 If you have time, please pray for those in Queensland! It’s been a devastated month for Queensland (actually, MONTHS!). I watched the videos in shock!!! 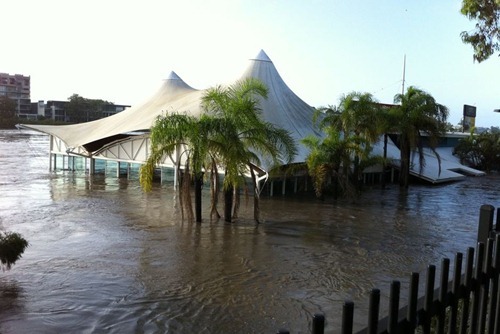 The flood has hit Towoomba, a city very near to Brisbane! The water will reach Brisbane soon :(. I’ve been so worried about my friends over there. I have a good friend of mine whose family is in Rockhampton, one of the hardest hit area in Queensland. I’ve been trying to contact him with no success. I hope he and his family are okay. I pray that all of my friends in Queensland are going to be alright. Hope the situation is getting better soon. Amin. 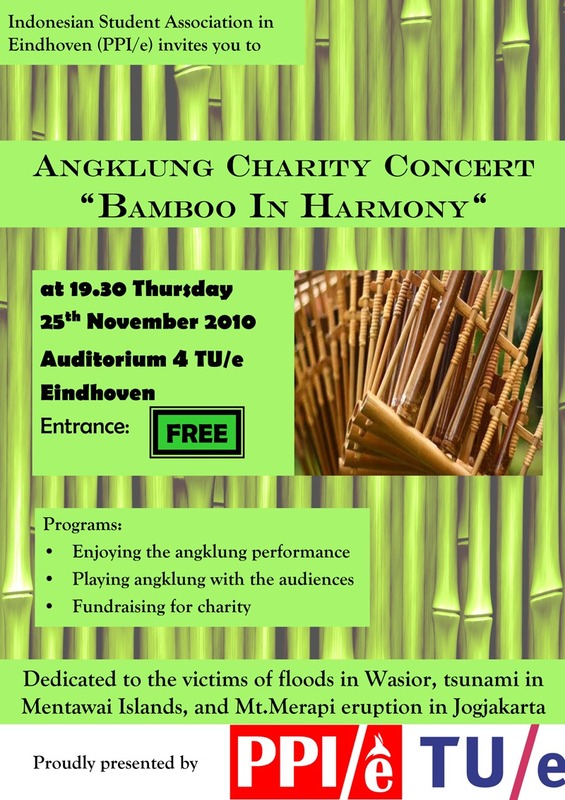 I wrote a few days ago that we’re going to hold our first angklung concert at the campus at the end of this month. The concert is titled Angklung Concert: Bamboo in Harmony and is going to be a charity concert dedicated for the victims of Mentawai, Merapi, and Wasior disasters that happened in Indonesia. I’m really excited about it! Not only because it is going to be my first time performing angklung in front of the public audience, but also because it has a noble purpose behind it. So I want to make sure that the event is going to be a success and a lot of money will be raised from it. So I proposed to make a video about the three disasters. Perhaps, by showing it to the audience, they’ll be touched and feel obligated to donate some money for the victims. Up until now, I’ve been busy searching for pictures, videos, and facts related to the those disasters on the internet. It turned out that it was not an easy job, because I had to look at those sad pictures and watch those heart-breaking videos… It really made me cry. There’s an angry surge inside me to do more… but again, I couldn’t do much things here. Bless those volunteers and humanitarian workers who have been working round the clock to provide the needs of the victims. May Allah SWT reward their good deeds in the hereafter. Amin. It just happened that I was still registered to the newsletter of the Brisbane‘s Mayor, Campbell Newman. I was practically surprised to read a number of measures and initiatives he had done or was planning to do to raise awareness about the possible flood in Brisbane and to make its residents better prepared for the disaster. + Completed and made public local flood studies. + Made free flood reports available online for individual properties. + Made free flood flag maps available online with comprehensive information relating to flooding. + Installed flood warning lights on ‘at risk’ roads. + Implemented tough planning controls to prohibit development below the one in 100 year flood mark. + Conducted public education campaigns to raise awareness of the risks of suburban flooding in Brisbane. + Introduced a free SMS service (Early Warning Network) for Brisbane residents to advise them in advance of bad weather in their local area. + Funded a flood buyback scheme to purchase worst affected homes. 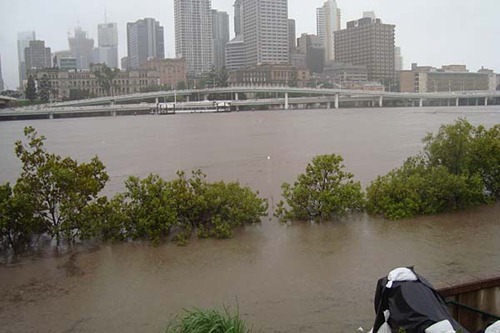 I mean, come on, Brisbane hasn’t experience any significant flooding since 1974, but they wanted to make sure that this disaster would never repeat again. So as soon as the increase in rainfalls was detected, they took some steps to mitigate flooding. The approach that he took is EXTREMELY different than that of the governor of Jakarta, who did nothing to prevent the annual infamous Jakarta’s flood from happening. Even so, he blamed the weather for it. Maybe he should learn from Mayor Newman, or even better, the Dutch!!! Earthquake, tsunami, volcano, and floods. Indonesia is threatened by yet another natural disasters (well, the flood happens every year in Jakarta and I blame the government for that!). They all happened in one single day. God bless Indonesia and the victims!!!! As usual, I feel helpless here, not able to do anything other than sending my prayers. For 25 years, I’ve ‘escaped’ from these disasters. I am lucky in that sense, but somehow I feel like I need to feel how it’s like to be one of the victims. Just to make my life more meaningful. Or make myself more grateful. With that experience, I hope I can help people who are in desperate needs. Possibilities are endless. Choices are abundant. To make it happen, that’s another story and I have to make sure that I will make it happen.